India Data Card Market reported a Total Unit Shipment of 1,723,709 units in CY Q3 2013; representing a decrease of 7% as compared to the previous quarter Shipments of 1,851,334 units. HUAWEI emerged as the market leader followed by ZTE and IBALL in CY Q3 2013. 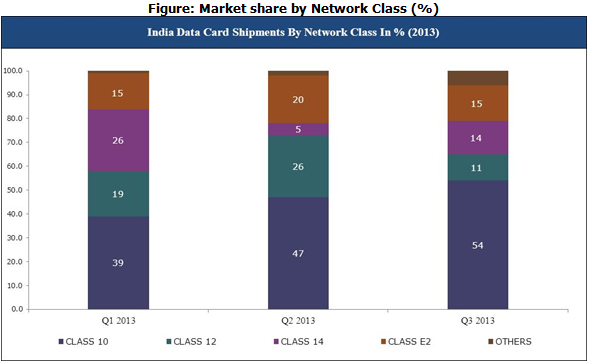 India Data Card Market reported a Total Unit Shipment of 1,723,709 units in CY Q3 2013; representing a decrease of 7% as compared to the previous quarter Shipments of 1,851,334 units. HUAWEI emerged as the market leader followed by ZTE and IBALL in CY Q3 2013.Out of the total unit shipped GSM based data cards represents 70% of the market share. Additionally, the Universal Mobile Telecommunications System (UMTS) represents more than 51% and High-Speed Downlink Packet Access (HSDPA) featured data cards amounted to more than 65% of the Total Unit Shipments. Source: 6Wresearch Quarterly India Data Card, CY Q3 2013. More than 18 vendors shipped Data Cards. Top three players together constitute 77% of the total market share. Out of total Data Cards shipped, 52% have 7.2 Mbps speed as well as 47% belong to EDGE Class 10 series. Note: Others Include Class 1, Class 4 and E3 Class. For the CY Q3 2013, HUAWEI exhibited an increase of around 30% which enthroned it as the market leader, whereas INTEX also witnessed a mercurial rise of more than 120% in its shipments. The Total Unit Shipments of data cards supporting 4G networks also witnessed a decline of 3% in CY Q3 2013 as opposed to CY Q2 2013. 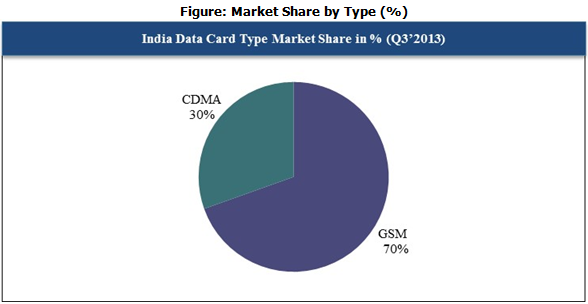 Qualcomm Chipset installed data cards still dominate the India Data Card Market for the current quarter.